Desde hacía varias semanas se especulaba con la posibilidad de que Disney y Lucasfilm estuvieran preparando una serie de películas individuales sobre personajes concretos de la saga Star Wars. Estos "spin-off" o "stand-alone movies" se complementarán con las tres nuevas películas que continuarán expandiendo la franquicia. "There has been some speculation about some stand-alone films that are in development, and I can confirm to you today, that, in fact, we are working on a few stand-alone films. Lawrence Kasdan and Simon Kinberg are both working on films derived from great Star Wars characters, that are not part of the overall saga. We still plan to make Star Wars: Episode VII,Star Wars: Episode VIII, and Star Wars: Episode IX, roughly over a six-year period of time, starting in 2015. But there are going to be a few other films released in that period of time too." The implications for Star Wars fans will be great, because there will be more Star Wars released in the atmosphere, so to speak, that's new and fresh. I'll leave it to Kathy (Kennedy) and the Lucas team to release more details when they're ready. 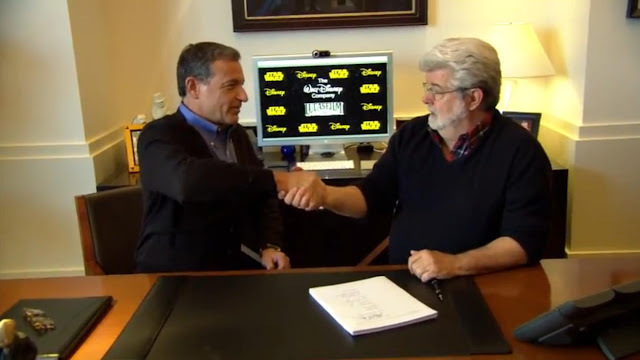 I mentioned the two creators, Lawrence Kasdan and Simon Kinberg, who, by the way, are working with J.J. (Abrams) as consultants on Star Wars: Episode VII." Los datos más relevantes parecen haberse confirmado: un joven Han Solo, previo a Star Wars Episode IV: A New Hope, y Boba Fett (entre los episodios IV y V) serán los protagonistas de estas nuevas películas. Fácil. Darth Plagueis y su aprendiz, Darth Sidious. ¡Yo (llamadme friki) quiero uno de Barriss Offee! Parece que van a exprimir la franquicia y el universo de Star Wars al máximo. Según apuntan los últimos rumores, están barajando una película sobre los orígenes de Han Solo y otra sobre Boba Fett. Yo me quedo con esta última.